The Deepwater Horizon oil rig burns in 2010; Photo by U.S. Coast Guard. A government report out Wednesday finds that British oil giant BP bears the lion’s share of blame for the 2010 explosion of the Deepwater Horizon oil rig in the Gulf of Mexico. 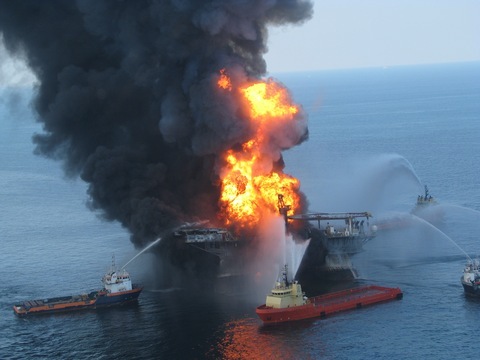 The blast killed 11 workers and led to the worst offshore oil spill in U.S. history. Transocean, which owned the rig itself, and BP, which owned the well, have both produced their own reports. Both companies, along with Halliburton, the contractor that performed cementing operations, have traded accusations of blame for months. Wednesday’s report cited communications failures and an “overall complacency” aboard the rig that may have contributed to crew members failing to either recognize the scope of the crisis or to shut down operations as it unfolded. The report also recommended dozens of changes to safety practices in the industry, including strengthening of the blowout preventer, a valve apparatus that sits atop the well on the ocean floor that is meant to be a fail-safe switch in the event that a crew loses control of a well. The blowout preventer on the Macondo well failed to shut it off, allowing millions of gallons of oil to spill into the Gulf over a period of months. The investigation did not find Transocean’s maintenance of the blowout preventer lacking, but did fault its training of personnel and for ambiguities in its well-control manual. In addition to the two earlier reports issued by the companies involved in the spill, a presidential panel released the findings of its inquiry in January. But because the current — and final — inquiry was conducted by the Bureau of Ocean Energy Management, the offshore drilling industry’s chief regulator, the results were especially anticipated because the recommendations could have great potential to tangibly change industry operating procedures. Legislators in Washington have pointed to its long-awaited release as the reason Congress has yet to produce legislation to reform industry practices.